How do I upgrade the bandwidth of my 5 Series MSO and what do I get with the upgrade? Bandwidth upgrades to 500 MHz and 1 GHz can be accomplished by ordering an upgrade product and entering a new software license into the instrument. The instrument bandwidth appears in the Help-> About menu near the top of the window, between the Model and Serial Number. (Unlike the other software licenses, the bandwidth license does not show up in the list of installed options.) The license is installed by tapping the Install license at the bottom of the page and navigating to the license file. If you are upgrading from 350 MHz to 500 MHz, you will receive a software license, a printed calibration report for the 500 MHz bandwidth, and the appropriate 500 MHz front panel label for your instrument. If you are upgrading from 350 MHz to 1 GHz, you will receive a software license, a printed calibration report for the 1 GHz bandwidth, the appropriate 1 GHz front panel label for your instrument, and one TPP1000 1 GHz passive probe per channel. If you are upgrading from 500 MHz to 1 GHz, you will receive a software license, a printed calibration report for the 1 GHz bandwidth, the appropriate 1 GHz front panel label for your instrument, and one TPP1000 1 GHz passive probe per channel. 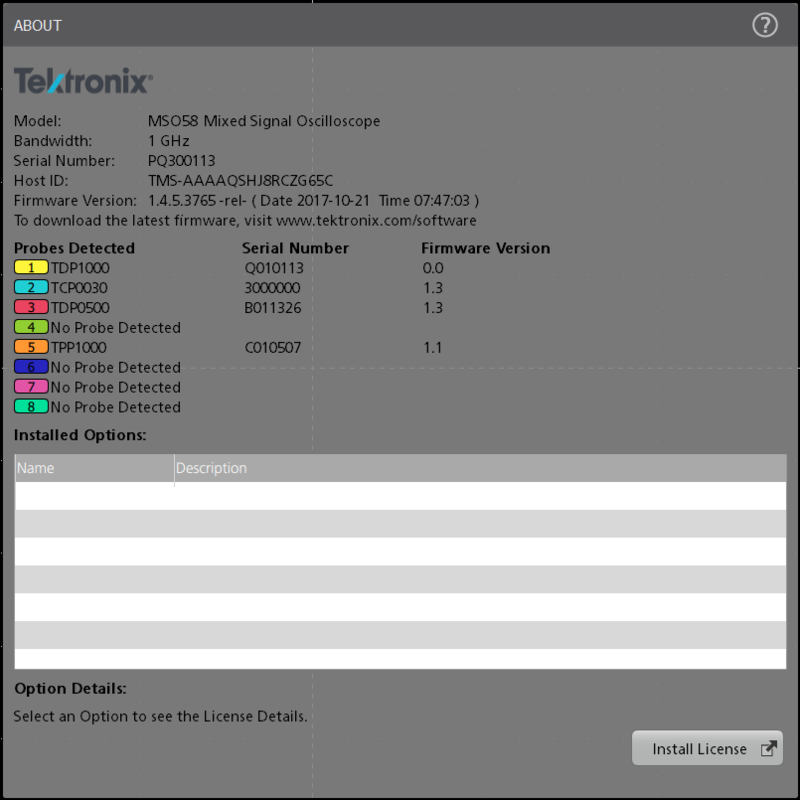 Bandwidth upgrades to 2 GHz require a hardware upgrade to the instrument in Tektronix factory service. This is accomplished by ordering the appropriate upgrade with an installation and calibration service option. Option IFC provides installation and calibration of the instrument, while option IFCIN also provides an incoming calibration and calibration report. If you are upgrading from 350 MHz to 2 GHz, your instrument will be returned with the printed calibration report(s), the appropriate 2 GHz front panel label installed, and one TPP1000 1 GHz passive probe per channel. If you are upgrading from 500 MHz to 2 GHz, your instrument will be returned with the printed calibration report(s), the appropriate 2 GHz front panel label installed, and one TPP1000 1 GHz passive probe per channel. If you are upgrading from 1 GHz to 2 GHz, your instrument will be returned with the printed calibration report(s) and the appropriate 2 GHz front panel label installed.